A death bed confession along with entirely new and provable facts will turn this entire case upside down. Everything you thought you knew about the Lindbergh Kidnapping was wrong. This book explores all the unknown facts concerning the early stages of the Lindbergh Kidnapping that were either ignored, forgotten, missed, or shrugged off. Among this new material is the death bed “confession” which has been long sought after by just about anyone who has ever researched this crime. It undeniably turns this crime upside down! Anyone familiar with this sensational case will be completely shocked to learn about this new important information and once applying it, no matter how it is interpreted, will realize the solution is obviously at hand - once and for all. MICHAEL MELSKY SHINES BRIGHT LIGHTS IN DARK CORNERS Infinity Publishing’s Marketing Department graciously emailed me a review PDF copy of The Dark Corners and while I plan to do an in-depth book review, here is the Reader’s Digest condensed version for now … The Dark Corners may well be the best book written on the Lindbergh kidnapping case. An incredibly informative, exciting, and engrossing read, TDC is extraordinarily well researched (15 years worth! ), meticulously and exceptionally well-told, and (for a non-fiction book), it’s a real page turner. Melsky has wisely chosen not to re-hash the story in a linear fashion; George Waller and Lloyd Gardner (among others) have already walked that ground (along with Mark Falzini’s excellent character studies). What Melsky does is delve headfirst into many of the more interesting puzzle pieces, challenging the reader to reevaluate the case and then draw their own conclusions and solutions. These individual puzzle pieces are reflected in their chapter titles: 1. Strange Vehicles 2. NYU Dinner 3. Hurley 4. The Warped Shutters 5. Customary 6. Strange Noises the Lindberghs Heard (And Did Not Hear) 7. A Tale of Two Dogs 8. Murray Garsson (“G” Man) 9. The Whateleys 10. The Nursemaids 11. Betty Morrow 12. The Crime Scene 13. The Layout 14. The Next Phase 15. In the Shadow of Death 16. Lt. “Buster” Keaten Among the many gems -- we may never view shy, demure, innocent Betty Gow in the same light again. She chomps chewing gum in the morgue while identifying Charlie’s body. And don’t get me started on the meat skewer! The pièce de résistance has to be Melsky’s discovery and confirmation of an actual “deathbed confession.” Simply amazing find. “Buster” Keaten’s wrap-up chapter is equally illuminating, a perfect ending to Volume 1 making us want to pick up Volume 2 immediately. With 1,033 footnotes supporting practically every chapter (if not sentence), no one can fault Melsky for not doing his research and sharing it all with us. Two words to summarize. The Dark Corners is compulsively readable. It brings to light endless bright corners for further thought, reevaluation, and discussion. Can’t wait for Volumes 2 and 3. Kudos! Great work! Michael Melsky takes the reader on a journey through the Crime of the Century that allows us to see inside this crime in a very revealing way. You will learn many true facts about the Lindbergh baby kidnapping that have not been published before. Each chapter is packed with documented revelations about the people and events that comprise this historical crime. Michael Melsky's exhaustive research on this case shines through on the pages of this book. It is a MUST READ for everyone who has an interest in this case, is a student of this crime, or just thinks they know all there is to know about the Lindbergh kidnapping. You will definitely be amazed by this book! The 1932 kidnapping and murder of famed aviator Charles Lindbergh's twenty-month-old son was arguably the most tragic and disturbing crime of the twentieth century. It was also a crime of unusual complexity that included a month-long ransom negotiation and many peculiar circumstances that have never been satisfactorily explained. Inevitably, present-day students of the crime fall into one of two categories: i) those who find the standard narrative of the case entirely satisfactory and are content to ignore its many inconsistencies, and ii) those with the grit and patience to confront those anomalies and attempt to explain them. In the latter group is Michael Melsky, whose new book, THE DARK CORNERS of the Lindbergh Kidnapping, summarizes fifteen (!) years of meticulous study of thousands of investigative documents archived by the State of New Jersey and made available to the public. The book is not an introduction to the case (for that the reader can turn to any of several popular treatments), but a collection of detailed chapters on individual topics along with the author's very shrewd analyses. As a longtime student of the case myself, I was completely spellbound by THE DARK CORNERS, whose amazing detail helps create the illusion of being transported back in time to the Depression-era crime scene. Overall, the book is a work of great scholarship and devotion whose study may someday tie up the many loose ends of a terrible crime. 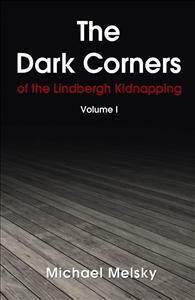 I ordered The Dark Corners of the Lindbergh Kidnapping, Volume 1, the minute I learned it was out because I was aware of Michael Melsky’s years of dedicated research and his reputation among Lindbergh Kidnapping Case researchers as a stickler for detail, and I expected something monumental. Melsky did not disappoint! I couldn't put the book down, and now that I’ve read it, all I can say is "Wow!" This is without any doubt the best book available on the subject. Melsky makes sense of a number of aspects of the case by synthesizing seemingly unrelated, insignificant, disparate, and discarded findings, and all without explicitly telling us his theory. Instead, he leads us to points from which we can draw our own conclusions. Very impressive! Thankfully, Melsky wastes no time introducing the reader to the Lindbergh Kidnapping Case; this is a book for seasoned LKC researchers and assumes the reader knows the players and the basic details. Accordingly, his treatment of the evidence and various other points is high-level and satisfying. The Dark Corners is well-organized, thorough, highly informed, and thoughtfully written. Take, for instance, the way Melsky discusses the strange vehicles in the vicinity of the Lindbergh estate in the days leading up to and following the kidnapping. Some of these vehicle sightings have been discussed at length in other books, but many are noted only in police reports that researchers have overlooked or otherwise dismissed. Only when he places all the findings in front of us do we begin to see a picture that makes sense. A lot of sense. Take, also, the way Melsky develops the personality of Betty Gow. He very effectively, across the span of volume 1, gets the reader to see that she is no ordinary young woman—quite the contrary. She is complicated and appears to be deeply involved in some way or other; not pegged as guilty or even necessarily in possession of any guilty knowledge, she nevertheless manages to evolve/devolve as his book delves into her roles as nursemaid to Charlie, girlfriend to Red Johnson, peer to the other house staff. Understanding Betty’s personality is crucial to fully comprehending her statements and comments, as it's easy to misinterpret her written words. I don’t believe any other researcher has given us as clear insight into Betty as Melsky has thus far, and I trust there’s more to come. As the title suggests, Melsky looks into those hiding places most of us hadn't thought about (or offhandedly and foolishly dismissed because they didn’t seem worth exploring) and comes up with some amazing finds—trust me! Even so, I think the strength of the work is the clarity of vision, the ability to see through it all and pull it together. It takes great familiarity, insight, and intuition to lay everything out and look at it in context--and find the twisted path that leads to the truth. I believe Melsky is comfortably on his way down that path. Actually, I suspect he may already be there and just hasn’t told us! There is a sense of urgency to this book, meaning, the truth is trying to get out—you can just feel it--and every page gives promise of a step in that direction. Alas, we are left hanging until Volume 2 comes out, but it will surely be worth the wait. This book is not only a good read, it is a MUST read, as it will be indispensable in any respectable Lindbergh Kidnapping library. A superb book and critical addition to the literature! Disclaimer. You should know a little about this case to really understand this book. Even a quick Wikipedia review would suffice. So overall, this book is an edge of your seat “Who done it” thriller. It is a detailed and factual story of the crime of the century. Each chapter is filled with facts and undiscovered experiences from the crime scene with footnotes listed at the bottom of each page to substantiate. Betty Gow for instance, who was supposedly the distraught brokenhearted caregiver. Was I wrong? I was amazed how this book is seemingly a firsthand account that provides a deep insight into what, in other books, is just a listing of factual information- and most of it WRONG! This amazing book and author supplies an in-depth analysis of various aspects of this case often glossed over by other authors; it provides great material and content; obviously countless years of research. It’s factual yet understandable work. A definite must read!